A hunting lodge atmosphere, complete with horn chandeliers, bolsters a menu featuring game, grits and local greens. 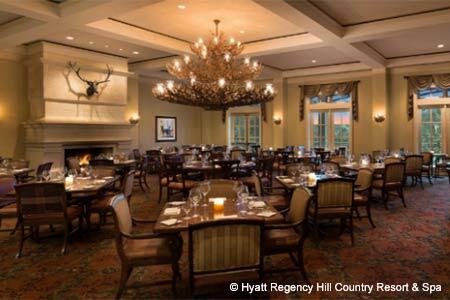 : Horn chandeliers may dominate the dining room of this luxurious resort and spa boasting a high-toned hunting lodge feel, but the menu is less Ralph Lauren-rustic --- to a degree. A starter of pork belly and scallop with local honey glaze evokes both big-city tastes and local traditions, and Texas quail with grits blends Hill Country flavors with Old South sentimentality. Entrées are labeled Range, Ranch & Sea and include venison chops and both antelope and bison tenderloin, short rib osso buco, and pan-seared Gulf redfish. Seasonal sides such as sweet chile chard play to market-driven appetites, and as a different chef has taken over the kitchen, we hope for further elaboration of a menu that has seen more adventurous days. Texas Hill Country wines, a logical local tie-in, aren’t featured on a wine list that’s biased toward California; we’d like to see more courage here, too.